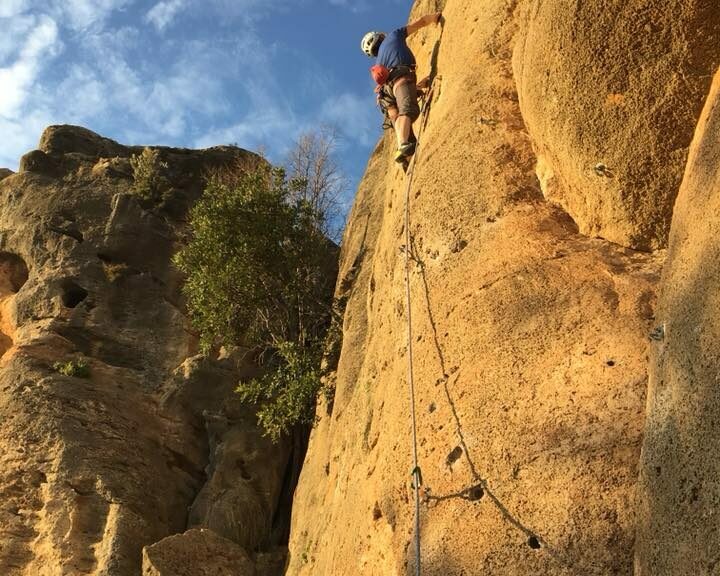 It’s usual for the club to arrange a sport climbing trip to Spain in march or February but this year was a little different, for me at least. 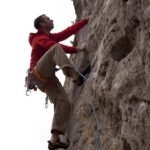 An old friend had returned from India after ten years and suggested a trip to the Costa Blanca even though he hadn’t climbed for 12 or more years. Straight off the plane we walked from our Altea apartment up to Toix Oueste and managed 3 routes before the sun went down. The next day we went to Guadalest where the weather was considerably warmer than last time I visited. 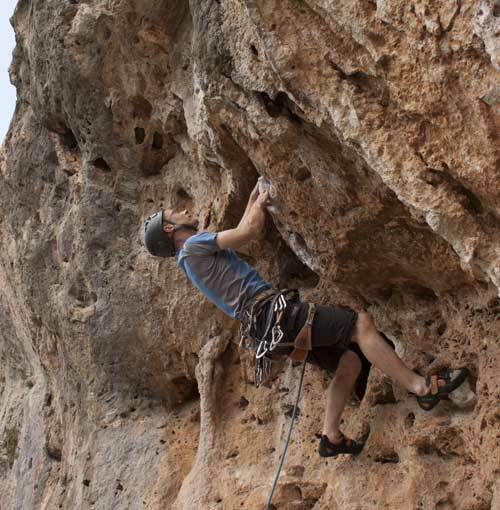 Rob astounded with a lead of the very pumpy Margallo 6a+. We bumped into another friend that I hadn’t seen since the 80s here who recommended Montesa so that’s where we headed next and it did not dissappoint. The very best crag we visited with an amazingly rough, pockety limestone which we liked so much we came back a day or so later. Two of the best 5+ ever were the rockfax guide was a litel difficult to read here as they had opted for a very wide angle photo for the topo, making it difficult to read. The following day it rained lightly most of the dsay so we declared a recovery day. 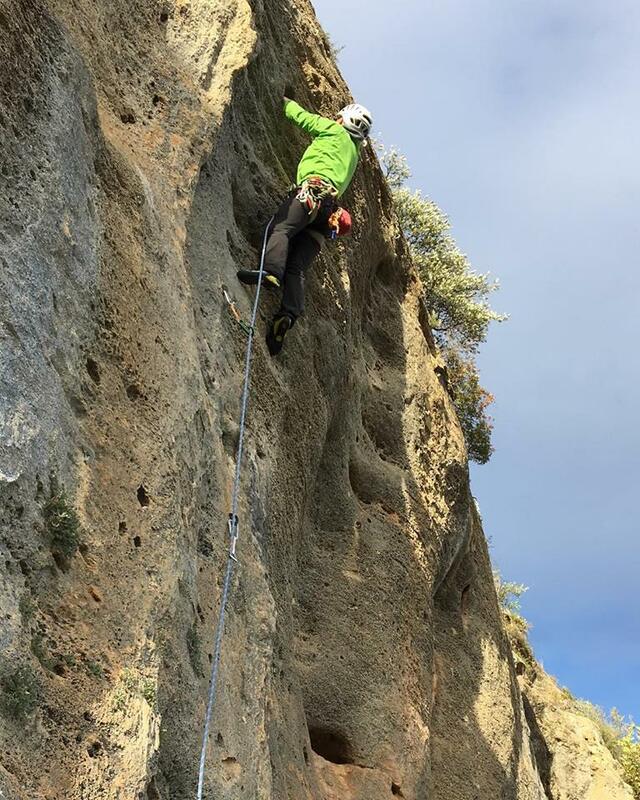 The next crag on the list was Sector New Year’s Day in Sella, which Gerard O’Sullivan had suggested [thanks!]. This was another great crag with plenty of good holds although quite busy. Trying to avoid the crowds we were thoroughly sandbagged on Perlita. Alacalali was the next stop. Here the sun was shining but the wind was approaching gale force when we arrived. As it dropped we were able to head up to the left hand end of the crag for some shelter. 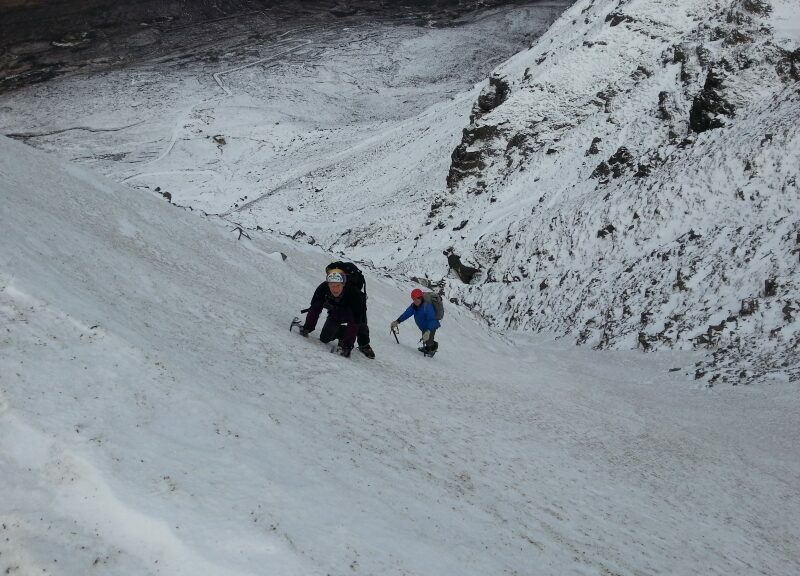 An excellent couple of 6as and some very steep 5s were our reward. The final trip was a return to Montesa. There was no sun this time, but we met a German couple at the end of their year long road trip and we discovered they had a wicked sense of humour. We grabbed a couple of lines before the rain came and we retreated to the Cafe Aurora. Once more the Costa Blanca welcomed us as we avoided the beastly weather at home. Adios until next year. 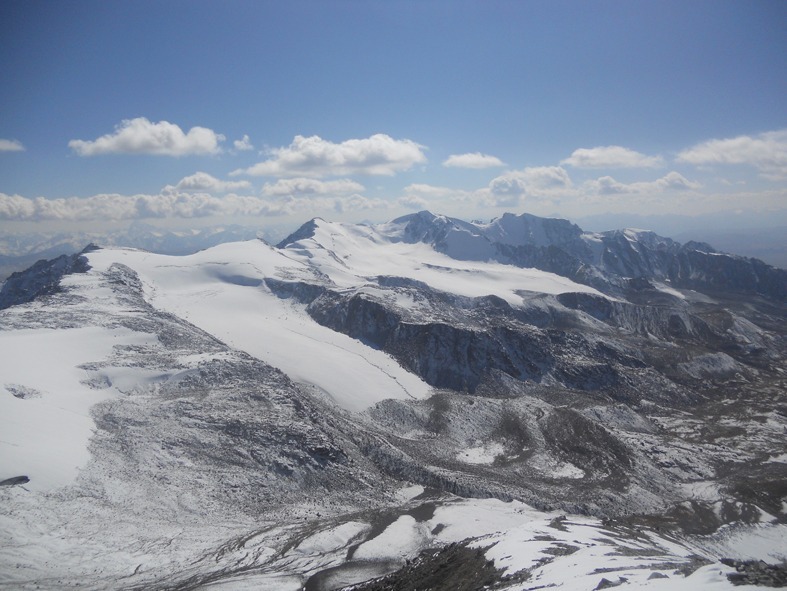 The Jetim Bel range is remote and little visited by outsiders, never mind climbers. So remote are these areas that only the very highest peaks are named. Nomadic herders, tending horses, cattle and yaks are still the only people to be met. 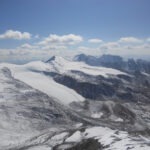 As we arrived in mid September the higher valleys had already been emptied and the lower yurts were being packed away. We climbed four peaks in total with one probable first ascent and all First Irish Ascents. 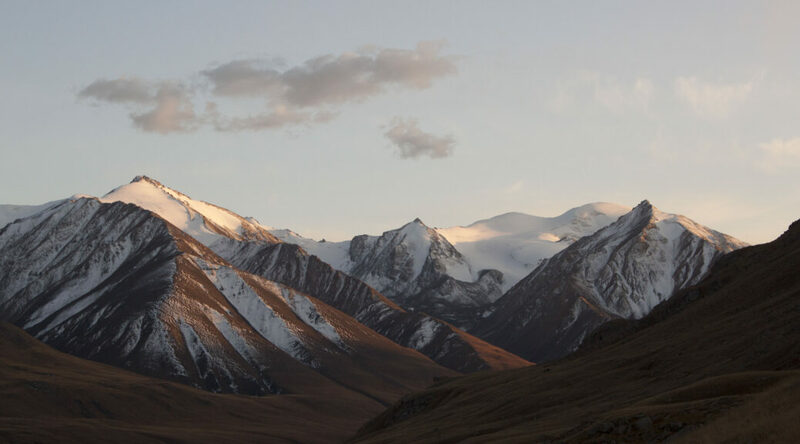 The first base camp in the Naryn Valley at an altitude of about 2950m, was reached by the versatile Kamaz six wheel drive vehicles in about 6 hours from Bishkek. After an acclimatisation visit to the twin lakes at 3500m we were ready for our first ascent. During the night snow had fallen and the start felt like a Scottish winter. Soon the sun came out though and the climb to the romantically named Pt 4327 improved. This was a relatively simple peak, up snow to the col but the final shale slope was tiring after the 7km approach. 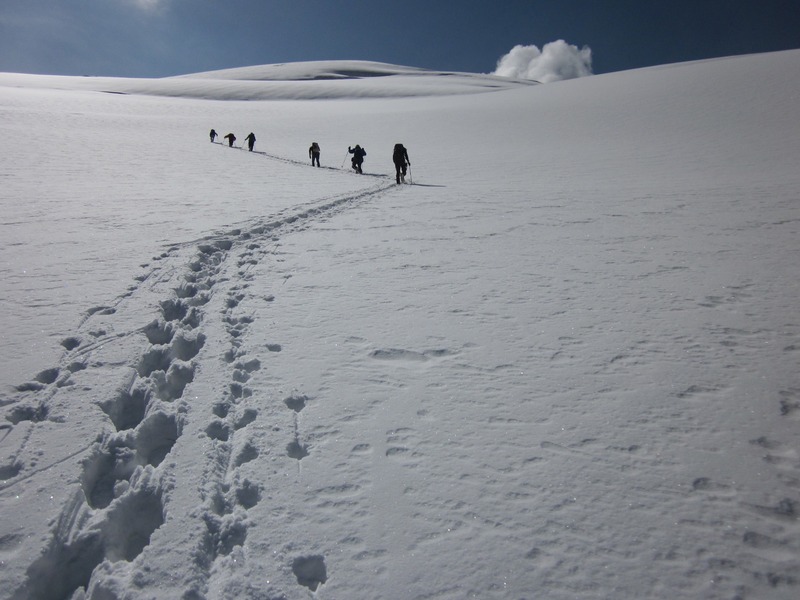 By the time we returned to camp the sun had cleared most of the snow. The next day we moved camp, driving some 50Km east to the confluence of Naryn and little Naryn rivers. In the afternoon we ascended Pt4069 to recce the next day. Pt 4343 was a slightly more technical Peak but easier to ascend (1300, F) once the snow was reached. This area was visited by a French Party in 2004, but there were no records of them climbing this peak, nor was there a cairn. Camp 3 was a further 10km east at a shade below 3000m. Again we ascended to a summit above camp (pt 4005) to spy the route opposite. The final peak, Pt 4624, was almost entirely on snow but the recent fall made going a little difficult, (900m PD-). The final summit ridge dropped away dramatically, making the summit rocks a challenge. Summary: Within a few hours flight of Dublin is an extremely remote area with loads of potential for exploration. There is positively loads to do here without much technical difficulty or the need for extensive acclimatisation, meaning a trip can easily be fitted into annual leave. 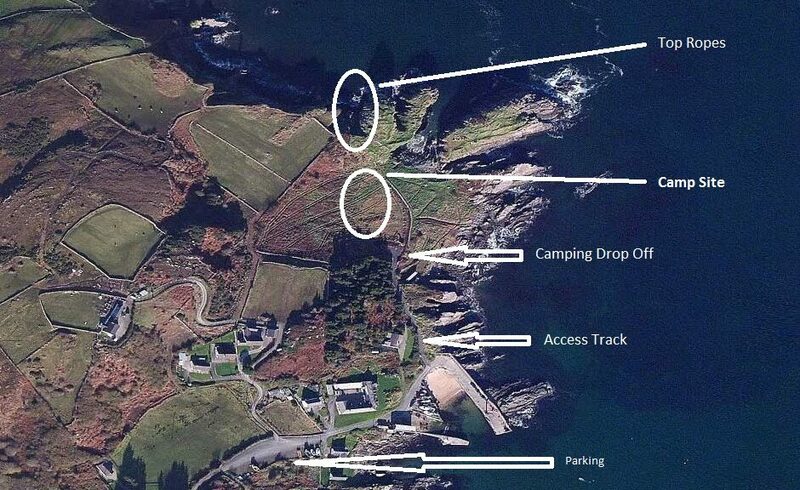 For those that haven’t visited Climbfest before here is a little guide of how to find the campsite and most of the top ropes. Bunagee pier can be found by taking the R238 right through the village then turning right over the bridge towards the filling station. Carry on along this road for a mile or so then turn right at a sign for the pier. A further mile brings you to the pier. Please remember to park tidily as this is a still a working fishing pier. 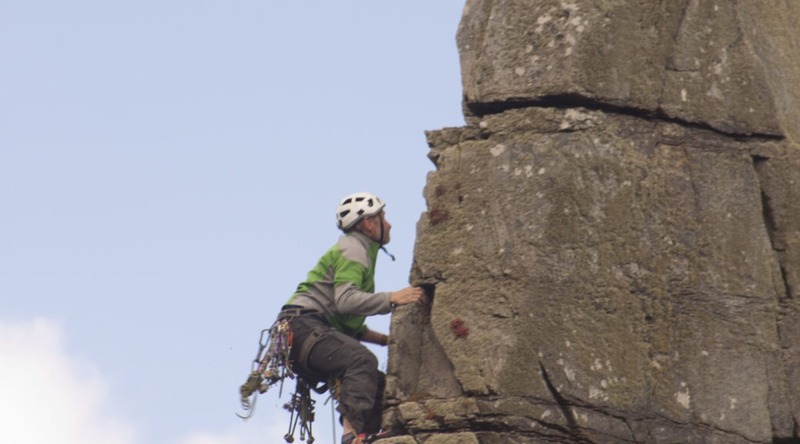 The Saturday morning session is at the main crag at Dunmore Head. This can be found by following the shore road from the village. After a winter indoors the flying four of Gerard, Seamus, Kevin and Geoff set off to enjoy the delights sunny Spain. Or at least that was the plan. The weather had other ideas. An atrocious forecast for the Siurana area saw us heading south to Alicante. A last minute phone call from the Ryanair check-in queue and Gerard had found great accommodation in Finestrat. Our plan was to stay in that area for a few days then head for the hills but the weather changed our plans once again and so we stayed where we were. The climbing was always great and we did sometimes see the sun. 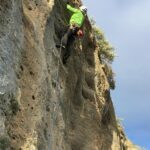 We visited a different crag every day with styles ranging from the steep pockets of Gandia to the slabbier Sella. Other attractions were Alcalali, Guadalest, Reconco and Olta. Gerard and Kevin romped up loads of 6b+s and Seamus and I managed many 6a s. Altogether a great week -same time next year lads? The weather had smiled upon us once more so Marty, Alan and I headed back to Muckish, this time with an eye for Divided Loyalties. Having seen it on Sunday we thought the cold snap would have produced some build up, but sadly not. After some manoeuvring with Marty’s van we arrived at the start of the miner’s path and decide to ditch the original plan. It just looked too lean. And so it was that we headed off once more for god’s own gully. It was still the only route in condition. Once again it provided great entertainment all the way. This time it was much more relaxing without anyone ahead of us, particularly someone without axe or crampons! The snow again was in great condition and the icy step providing a bit of interest and the top snowslope a great sense of exposure. Marty was keen to do more so we traversed along the escarpment and descended just to the right of the colossus pinnacle. This gave us a close view of the summer possibilities. The fresh snowfall over the Monday and Tuesday had added a good deal of unconsolidated snow into the descent so some wading was called for. We traversed along the base of the crag to a line of Iain Millar’s just right of Divided Loyalties. Sadly this was not in as good condition as the first. Although it looked good it was full of powder. At this point Marty had enough of carrying his sack and threw it away down the slope. Luckily his camera was in his hand and a banana was rescued from the snow! 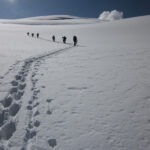 A lot of cursing of the soft snow brought us up to the final snowfield but it really was a pale imitation of the first gully, but a good excursion. Not recommended just now. Maybe God’ Own gully does deserve the title. We descended the miner’s path and were surprised at the amount of snow that had banked it out since Sunday. Alan and Marty traversed back to retrieve the sack and we all headed back to the van. A great day out. With over two years of construction, many false starts and goodness knows how many hours of planning, discussion and specifying, the new wall at St Columb’s Park is finally taking shape. With only the holds to be added, – about 1800 have been ordered, the ‘Foyle Arena’ as we must learn to call it, is very nearly ready to welcome the first climbers. 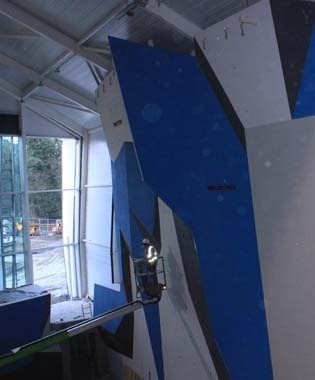 The climbing wall is the central part of the massive new complex that includes two swimming pools, a cafe and a (very) large hall. The wall has a monstrously overhanging competition wall on one side and a vertical wall on the other side. Under the large window that gives loads of natural light there’s a dedicated, mega steep bouldering area. Some of the wall can be seen from the car park but you really have to go inside to really get the feel of it. The plan is to have two MI nights a week for members, but there will be open access at all times the centre is open, 7.00am to 10.00pm apparently. Alpine starts anyone! With only a few weeks left I for one can’t wait until it opens, probably first week of April, but I’ll just have too! The only thing we wait to know is how much entry will cost but I’m sure it’ll be reasonable. I’m sure the way the wall is highly visible from the café and reception bay windows will attract lots of people to ‘come and try it’ sessions and so we can look forward to lots of new members. 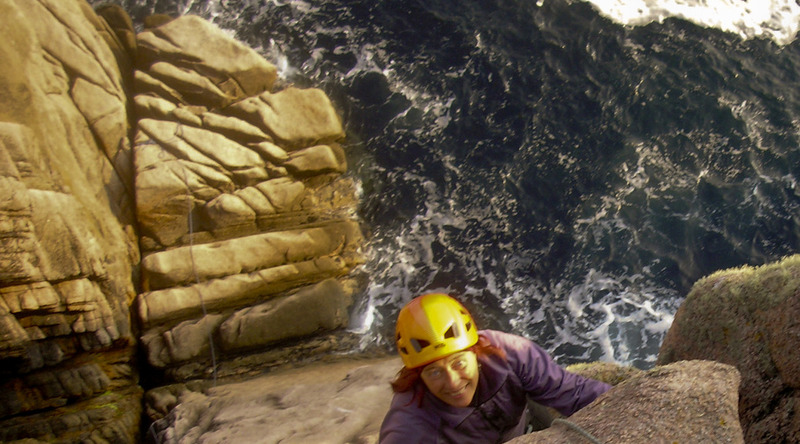 I’m certain this wall will transform climbing in the North West, Donegal and beyond. Lastly, a big thanks to Rodney and Paul Who have put an extraordinary amount of time into getting this project built. There are more photos in the gallery but they have gone to the second page somehow. The weather continued to do as it was told so Marty, Valli and Alan paddled over on Friday evening while I caught the boat with young Dhonail at the helm. Also on board was Mauritz, a young German hitchhiking surfer that Valli found. Saturday dawned windy and cloudy but dry so once Ivan arrived we all headed off. A bit reluctantly at first, thinking there may be a bit of shivering to be endured. By the time we reached the fluted wall area though the sun was shining. Marty and Alan picked Promethius, a great looking line. A real classic and a photographers’ dream, a three star route probably. If it was in Cornwall this would have climbers all over it. Ivan and I headed down to the seaward end of the opposite side of the zawn and put up a couple of new lines – steeper than they looked! Lovely and warm in the sun though and out of the wind. The day ended with a mass ascent of Darcy, which is again a real classic up a fine slab, worth at least 2 stars. Sunday was another sunny day and we headed back to the same area. 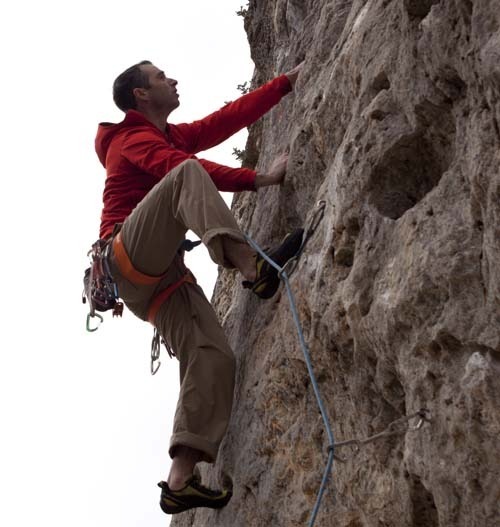 No new lines were climbed but Alan did explore a few lines. so still plenty to do on the Island. Ivan and I climbed Promethius, posed for photos and confirmed its classic status. A bit freaky going down to the hanging belay but ok once the solid cams in place! Marty again paddled home with Ivan and Karen, while I guarded the luggage. We left Alan and Valli to enjoy another evening A great weekend and I can’t wait to get back, even if it may be next year now.